Doesn’t work, you wet yourself, and can’t get it up! Lovely trial in this month’s New Engl J Med (click here). 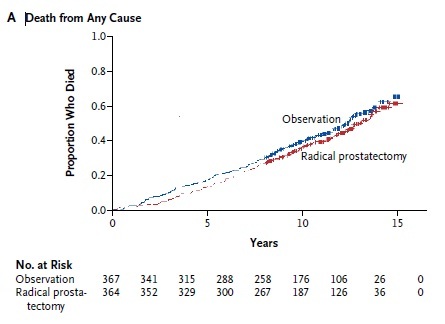 The authors compared radical surgery with observation, for men unlucky enough to have prostate cancer detected on screening. A sensible trial because most screen-detected cancers never cause trouble, and surgery has side effects. The planned sample size (trial registration here, although the original sample size is not very clear) was 2,000 (1,000 per group) but due to slow recruitment they stopped at 731. This is made clear in the paper. The pre-determined primary endpoint was all cause mortality at a median follow-up of 10 years. There was no difference. Surgery 171/364 (47.0%) observation 183/ 367 (49.9%) (hazard ratio, 0.88; 95% confidence interval, 0.71 to 1.08; P = 0.22; absolute risk reduction, 2.9%). In case you think that the 2.9% difference, which may well have ocurred by chance, is worth having, remember what it amounts to – about 6 months, of which about two will be spent getting over the surgery! One fifth of operations had a major complication, although only one poor guy died! More importantly how does surgery affect the 12 years you would have lived anyway? It almost doubles your rate of impotence from 124/281 (44%) to 231/285 (81%) and almost triples your rate of urinary incontinence from 18/284 (6.3%) to 49/287 (17%). And this is just for those who actually have a cancer detected. For each one of them, hundreds have a blood test, and maybe half a dozen have a needle biopsy of the prostate where nothing is found. Full marks to the NHS for resisting calls for screening. why would anyone choose this?